The streets of Istanbul were filled with the sound of vuvuzelas.. There were cheers and groups of people dancing and celebrating all down Istiklal. We watched the game in a bar in Nevizade, filled almost exclusively with our friends, among who there were just a few lone Dutch fans. 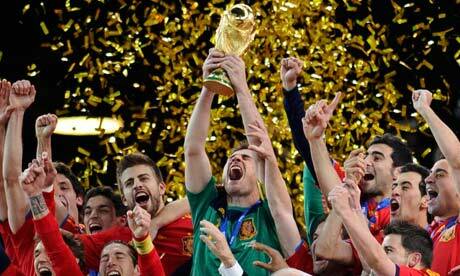 This was my first World Cup. I watched almost every game and went from supporting the US to Argentina and finally Spain. There were extreme highs like when the US qualified for the round of 16 at the 91st minute and extreme lows as watching Maradano and his crushed teams’ grief stricken faces as they saw their World Cup dreams die. I celebrated this great event as I read articles about how the World Cup brought joy to the poorest of people, reading one poignant headline that said, “For the Poor, Soccer is Everything” and it made my heart happy that this wonderful challenge gave such joy to some people who had nothing. And then I hated the game when I read about over 300 incidents of domestic violence on the night of England’s defeat and later the murder allegations against the Brazilian goalie. I wondered what kind of values this testosterone filled sports was promoting. South Africa brought pride to Africa by hosting an amazing World Cup. Their economy surely benefitted and a great sense of pride is surely felt by the South African people. And then there are the oft forgotten stories of all those that were displaced and ostracized because of the World Cup. Finally there were the hopes of a country who is facing its worse economic crisis with one in five people out of a job and the hopes of a country who apprehensively waited as their national team took their third attempt at being world champions. There will be players and coaches who will bury their World Cup dreams in 2010 and there will be those who have already began to think about 2014. So, who is in for Brazil?! Life in Istanbul continues on. And I never stop feeling like I am living in some sort of beautiful dream. For the last five weeks we have had guests in the house and now that there is a short lull in visitors, there is time to breathe, reflect and feel that more personal connectedness with the city. Most nights we take long, windy walks going down the same streets we have walked on hundreds of times now, each time still discovering something new but now with solid footing. I still feel slightly short of breath as I walk up the hill into the main square, I hold my nose as I pass the doner kebab stands (the dark meat never grew on me), and still laugh and smile at all the performers and the almost overwhelming sense that every type of humanity can be found on Istiklal. It may be a bit preemptive but already I am missing this beautiful city. I find myself sitting at the kitchen table watching the endless stream of boats going by and coming to terms with the realization that like those boats I am just passing and soon these times in Istanbul will be a fond memory. I get scared by the notion that life might never be better than this. Not because this is not enough. This is everything I could hope for but that instead as life passes by, I will always be looking with eyes to the past towards some definition of perfection that has already been achieved but can’t be duplicated. the fans in the stadium and you’ve got the makings of an upset. entire continent behind them. Ghana wins. I just can’t Brazil leaving the World Cup this early like in 2006. Easy win for Spain. Nuff said. wrote previously though, the best thing about Argentina is Maradona. beat. One of their star performers has gotta be the Turk, Mesut Ozil. or face the consequences. Messi will shine, and Tevez will score.